At Chase we are incredibly fortunate to serve four million American small businesses, each on their own mission to succeed. Our role is to make small business owners’ lives easier by providing financial services that save time and money, as well as capital to help them thrive. We accomplish our mission by getting to know our clients and their businesses, so we can make the right recommendations at the right time. It’s rewarding work. Chase bankers are working with small business owners and entrepreneurs who are solving big problems, making a difference in their communities and carrying on the family business. Their entrepreneurial spirit inspires us, and their personal commitment to quality commands the same of us. Bankers often deal in numbers, and we at Chase can recite some impressive ones. For instance, in California, where I lead Chase Business Banking, we work with nearly 700,000 small businesses. Some have a simple checking account, but many have an array of deposit, loan and cash management services that help their businesses run smoothly and successfully. In 2013 alone, Chase extended nearly $7 billion in new credit to help California businesses with working capital, equipment financing, real estate transactions and more. One of my favorite businesses is Montalvan’s Sales, founded by Carmen and Marcos Montalvan from Ontario, California. The Montalvans import, export and produce foods from Latin America and the Pacific Islands. Impressively, they have grown their business from a single truck and 90 items to multiple warehouses and distribution centers that handle more than 900 products. Chase provides credit to Carmen so she can better manage her cash flow and make smart investments in her growing business. 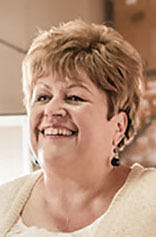 By having a real relationship with her Chase banker, Carmen knows she has an advocate and sounding board in us, not just a provider of a business loan. Recently I invited Carmen to accompany me to Salt Lake City for the U.S. Hispanic Chamber of Commerce national convention. At the time I didn’t realize the significance Utah has for Montalvan’s Sales. Carmen shared how she and Marcos established some of their very first customer relationships on a road trip in their family station wagon. Montalvan’s now has a fleet of vehicles, but she hasn’t forgotten those customers and what they meant to her early success. It’s because of Carmen’s remarkable journey and captivating personality that Chase chose to highlight her business in a national advertising campaign. Now people stop Carmen on the street to congratulate her on her success and ask about her business. Those of us who work with small businesses know that every customer is on their own journey and defines success in their own way. That’s why getting to know customers – and truly understanding the businesses they run – is the only way to effectively serve their financial needs. This fall we chose three new businesses to feature in our annual Mission Main Street advertising campaign, which asks business owners to share their success stories on camera, in living color, for the whole world to see. Another Hispanic-owned business – this one from Phoenix – is part of the multi-media campaign. Denise and Chris Hernandez took over the construction services company their father started in the 1970s. They have diversified, expanded and evolved – but they still turn to the same bank their dad came to for his first small business loan. By getting to know these customers – at a branch or at their place of business – we often uncover needs even our savviest clients didn’t know they had. Sometimes an SBA loan or line of credit is the right answer. As a preferred lender, Chase is able to expedite the SBA process and tap the power of the federal government’s popular guaranteed loan programs. That’s why Chase has been a top SBA lender for years, and the #1 SBA lender to women- and minority-owned businesses the past three years. At the end of the day, it really does come down to relationships. Carmen, Denise and Chris deserve personalized attention from professional bankers invested in their customers’ success. We are honored to support them, as well as thousands of other customers who trust Chase as their banking partner. There are nearly 30 million small businesses in the U.S., and they pack a punch when it comes to economic impact. One of the fastest growing segments of the small business economy, Latino-owned businesses are in every state and span every industry. I’m very proud to be part of the New America Alliance, which is helping advance entrepreneurship, corporate leadership and public service for Latinos. This year I was in New York at the organization’s annual Wall Street Summit. There we celebrated success, and challenged the business community to improve and create opportunities for the next generation of leaders. It is both a privilege and a duty to pave the way for the Carmens of the future. 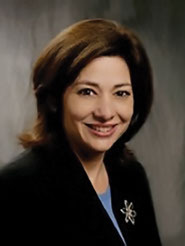 Alice Rodriguez is Executive Vice President, Chase Business Banking. According to the U.S. Department of Labor, by the time girls in middle school go to college, there will be one million more computer science jobs than computer scientists to fill them. Yet, less than one percent of high school girls express interest in majoring in computer science in college and the American Association of University Women reports only 19 percent of computer and information-science majors are currently women. When you put the lens on Latinas, that number shrinks to less than 1 percent. After twelve years executing fun, interactive digital media and technology training for Latina and other girls of color, Latinitas (www.latinitasmagazine.org) knows you can’t just say to a girl, “go code!” She needs lessons that speak to her gender, interests and culture, and for girls of color often she needs this presented by relatable instructors who look, sound and sometimes, grew up like her. in 2002, Latinitas, a 501 (c) 3 non-profit organization whose mission is to empower young Latinas through media and technology, has been a vital part of young Latinas’ lives through after school programs, camps, workshops and conferences, and the very first digital magazine made for and by young Latinas, www.latinitasmagazine.org. Based in Austin, Latinitas has served over 20,000 girls and teens with its self-esteem boosting services, intensive mentoring and lessons in web and graphic design, blogging, video and audio production, photography, video game and app development and, recently, coding. Latinitas employs an intensive mentoring dynamic, providing girls and teens much needed role models for academic and professional success. In 2008, Latinitas expanded services to El Paso with its first chapter office and has organized conferences for girls in Dallas, San Antonio, Corpus Christi and Las Cruces, NM. This past Fall, Latinitas teamed up with Google’s Made with Code campaign and programmers at Makersquare, Inc., a coding education company for its first Code Chica Conference, Oct. 25, 2014. This all day event for girls and teens ages 9-18 provided lessons in HTML and CSS, code applications and informal roundtable discussions with women of color who work in start ups, traditional technology corporations and other realms where technology is essential including IBM, Dell, BB&T Bank and new tech like Rackspace, Key Ingredient and SheHacksATX. Code Chica will also be integrated as a curriculum during Latinitas’ after school programs, weekend workshops and camps throughout 2015. Girls like Nicole Arrellano, age 10, liked Code Chica because she got to “learn things she hadn’t known” and when she was asked what she wanted to do after Code Chica she confidently answered, “Invent video games.” But, Nicole attends a Title 1 school in Austin where over 90 percent of the student population are living at or below the poverty level and the likelihood of having a device like a computer or tablet at home is less than 40 percent probable and internet, half that. The pipeline to get girls into tech is malfunctioning. It’s plagued by leaks including a still existing digital divide twenty plus years into the Digital Era, dissuasion and discrimination. In fact, Forbes reported over 41 percent of women in tech leave their first job because of discrimination. This leaves a crucial gap in new innovation because girls and women bring something different to the development table. Latinitas knows Hispanic girls and teens like to geek out. 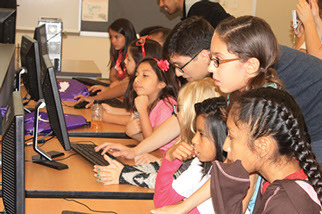 Over 250 girls meet weekly at Latinitas’ after school clubs and when polled about their favorite part of club is there is always a tie between, “go on the computer/va a la computadora” and “it’s just girls.” Latinitas uses their successful model of Latina empowerment bringing discussions of culture, identity and stereotypes in tech into the coding lesson, knowing a girls’ best tool in sexist environments is healthy self-esteem and confidence in one’s point of view. “I consider Latinos to be natural-born coders because, ultimately, they have to translate from one language/culture into another all the time. Now that I have been learning programming in an immersive environment, I still feel this is true. In tech what you’re dealing with is little bits of data, but every point in the process of transmitting that data demands that you present it in a different way. So, in a sense, being a programmer means that you speak different languages to say the exact same thing -- which is why I think Latinas bring not just skills and hard work to the tech space, but bring a familiarity with the processes required to make tech work well.” she said. Latinitas is planning more Code Chicas in Austin, San Antonio, Houston, Dallas, El Paso, TX and the Rio Grande Valley in 2015. For more information, go to www.latinitasmagazine.org. Laura Donnelly Gonzalez is the Founder and COO of Latinitas.